Born at Devizes, Wiltshire, early in 1634, Joseph Alleine loved and served the Lord from childhood. A contemporary witness identified 1645 as the year of Alleine’s “setting forth in the Christian race.” From eleven years of age onward, “the whole course of his youth was an even-spun thread of godly conversation.” When his elder brother Edward, a clergyman, died, Joseph begged that he might be educated to take Edward’s place in the ministry of the church. He entered Oxford at age sixteen and sat at the feet of such great divines as John Owen and Thomas Goodwin. Alleine began his studies at Lincoln College in 1649. Two years later, he became a scholar of Corpus Christi College, where the faculty was, in general, more thoroughly Puritan than at Lincoln. Alleine studied long hours, often depriving himself of sleep and food. He graduated from Oxford in 1653 with a Bachelor of Arts degree and became a tutor and chaplain of Corpus Christi. He also devoted much time to preaching to prisoners in the county jail, visiting the sick, and ministering to the poor. In 1655, Alleine accepted the invitation of George Newton, vicar of St. Mary Magdalene Church, Taunton, Somerset, to become Newton’s assistant. Taunton, a wool-manufacturing city of some 20,000, was a Puritan stronghold. Shortly after moving to Taunton, Alleine married his cousin, Theodosia Alleine, whose father, Richard Alleine, was minister of Batcombe, Somerset (see below). She was an active woman who feared God deeply. Early in their marriage, she ran a home school of about fifty scholars, half of them boarders. She would later serve as her husband’s biographer after his death. This small, polemical tract is bound with RE Publications’ edition of Alleine’s Alarm to the Unconverted. It is not included in the list of Alleine’s works compiled by Charles Stanford in 1861. No one is certain that it was written by Alleine, though its style is similar to that of his other works. The work is an in-depth examination of the Oath of Allegiance passed on August 24, 1662, and whether or not a nonconformist minister could conscientiously subscribe to it. The Act of Conformity offers an emphatic “No,” saying, “Taking this oath will encourage Parliament (when they shall see how glibly and smoothly we swallow every pill) to think themselves either infallible in imposing, or us as ductile, flexible and sequatious souls” (p. 45). 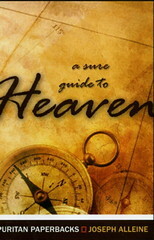 This evangelical classic was first printed in 1671 (subtitle: A Serious Treatise on Conversion), when 20,000 copies were sold, and subsequently reprinted in 1675 as A Sure Guide to Heaven, which was the title given to the latest BTT editions. 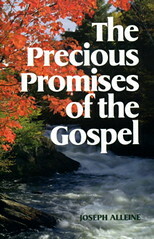 It is a powerful manual on conversion and the call of the gospel, as the chapter titles reveal: Mistakes about Conversion; The Nature of Conversion; The Necessity of Conversion; The Marks of the Unconverted; The Miseries of the Unconverted; Directions to the Unconverted; The Motives to Conversion. All of Christ is accepted by the sincere convert. He loves not only the wages but the work of Christ, not only the benefits but the burden of Christ. He is willing not only to tread out the corn, but to draw under the yoke. He takes up the commands of Christ, yea, the cross of Christ. The unsound convert takes Christ by halves. He is all for the salvation of Christ, but he is not for sanctification. He is for the privileges, but does not appropriate the person of Christ. He divides the offices and benefits of Christ. This is an error in the foundation. Whoever loves life, let him beware here. It is an undoing mistake, of which you have often been warned, and yet none is more common (p. 45). This book, reprinted some five hundred times and the most famous of Alleine’s nineteen treatises, has been used for the conversion of many souls. It greatly influenced the evangelistic approach of famous preachers such as George Whitefield and Charles Spurgeon. Despite a smattering of statements that may be misconstrued as promoting human ability in salvation, Alleine’s classic remains a golden example of evangelistic preaching and a spur to personal evangelism. A definitive biography of Alleine has yet to be written. The longest sustained seventeenth century narrative was written by his wife, Theodosia, following his ejection and imprisonment after the passing of the Act of Uniformity in 1662. In 1672, four years after his death and a year after the first printing of Alarm to the Unconverted, Alleine’s Christian Letters, Full of Spiritual Instructions was printed in London. The following year, fragments of biographical information and personal reminiscences were brought together by his widow and Richard Baxter and were printed with his letters. That volume was reprinted with corrections in 1677 as The Life and Death of that Excellent Minister of Christ Mr. Joseph Alleine (London: Nevil Simmons). Additional printings of the 1677 volume with minor additions or deletions took place in 1806, published by J. Gemmill; in 1829, by the American Sunday School Union; and in 1840, by Robert Carter in New York. The RHB reprint of 2003 includes the Carter edition, plus two letters from the Gemmill edition and three letters from Alleine’s Remains. Thus, for the first time, all forty-nine of Alleine’s extant letters are printed in one volume. An appendix contains George Newton’s Sermon Preached at the Funeral of Mr. Joseph Alleine (London: Nevil Simmons, 1677). Charles Stanford’s biography, Joseph Alleine: His Companions and Times, appeared in 1861. Though Charles Spurgeon called it an “admirable biography,” it, too, is incomplete, no doubt partly due to the paucity of details of Alleine’s life. Although Alleine’s Life and Letters suffers somewhat from not being a sustained narrative, it has the advantage of having been written by Alleine’s contemporaries. Allowing for some repetition and hagiographical tendencies, these pages display the portrait of a minister who had a large heart for God and for the precious souls of those who sat under his ministry. In this book, Richard Baxter wrote chapter 1 of Alleine’s biography. Richard Alleine, his father-in-law, wrote chapter 3. Other chapters were written by his senior colleague, George Newton (chap. 4), his widow (chap. 6), and his close friend and ministerial colleague, Richard Fairclough (chap. 9). The remaining chapters were written by several close friends who preferred to remain anonymous. You are a people much upon my heart, whose welfare is the matter of my continual prayers, care, and study. And oh that I knew how to do you good! How it pities me to think how so many of you should remain in your sins, after so many and so long endeavors to convert you and bring you in! Once more, oh beloved, once more hear the call of the Most High God unto you. The prison preaches to you the same doctrine that the pulpit did. Hear, O people, hear; the Lord of life and glory offers you all mercy, and peace, and blessedness. Oh, why should you die? Whosoever will, let him take of the waters of life freely. My soul yearns for you. Ah, that I did but know what arguments to use with you; who shall choose my words for me that I may prevail with sinners not to reject their own mercy? How shall I get within them? How shall I reach them? Oh, that I did but know the words that would pierce them! That I could but get between their sins and them (pp. 150-51). 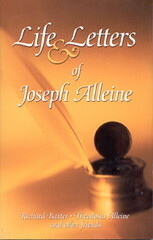 In a day when the desire for personal happiness and self-esteem have replaced the biblical mandate for holiness of life, a reading of Alleine’s life and letters can be a real tonic to the soul. This booklet is extracted from Richard Alleine’s Heaven Opened. It is one of the two chapters written by Joseph Alleine. Impersonating God in addressing His people, Alleine provides us with a moving declaration of the loving, merciful heart of the Triune God, revealed in the promises of Scripture, which are woven into nearly every sentence.